Replacement: None. 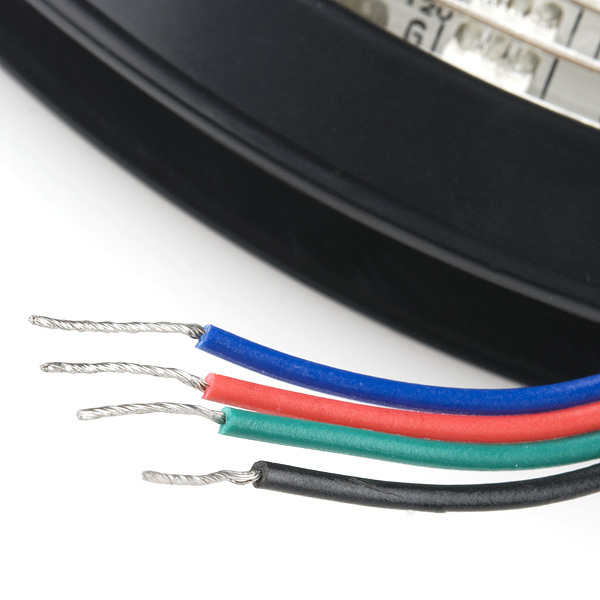 We are no longer carrying these RGB LED strips in our catalog. This page is for reference only. 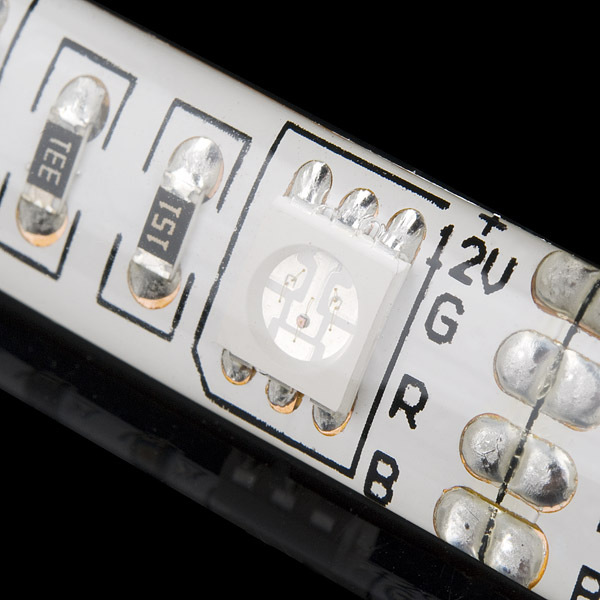 These LED strips contain 60 RGB LEDs per meter. The strips have a self-adhesive backing that you can use to stick the strip to cabinets, enclosures or the dash in your car (probably not recommended). They include current limiting resistors, so just add 12 volts and you're good to go. Oh, and did we mention they are waterproof? They are IP66 rated which means they can handle a pretty good soaking of water. Note: These come in 5m segments on a reel. They are preterminated with wires, as shown in the pictures. Note: We just realized the green and blue labels have been swapped. For those who are interested, here's a video I made with three of these strips around the ceiling of my apartment. I am using an attiny2312a for generating the PWM. The outputs are connected to a RGB LED amplifier for high current driving. These amplifiers make this easy since they have optoisolated inputs which allow a low current drive of the high current outputs. The light output from three of these strips is enough to light my apartment to a very usable level, especially when all three channels are on full giving white. This is probably a very stupid question but I didn't see it anywhere. Are these common anode or cathode? 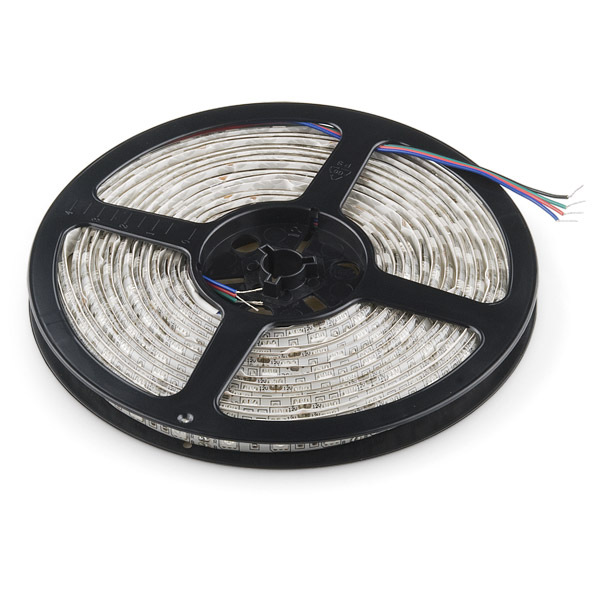 note: RGB Led strip is a 4 wire common anode polarity product. Not a stupid question at all since I can't see it anywhere either. 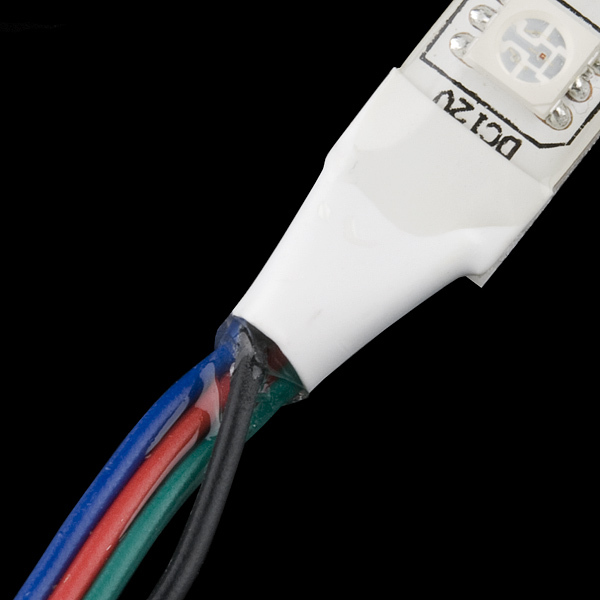 I have a similar LED strip and it's common Anode (+12V). Common anode is easier to drive, since you just ground the R,G,B pins with a MOSFET to turn each colour on. Dumb newbie question: The datasheet says current per 3 LEDs is 60mA - so 3 LEDs red channel only is 20mA or 60? Also, if the total is 60, is it 20+20+20 or some other distribution of current? that can fit over this tape to make something that looks like neon?? any ideas? any tubing? Any one tried to PWM these? Do they behave well or they flicker? Flickering is due to the PWM driver, not the LEDs. You need to increase the PWM frequency to remove flicker. How strong is the self-adhesive backing? I'd like to put some strips up on a wall, but they will eventually have to come down, preferably without any problem or noticable damage. It's a 3M adhesive, and it's pretty good. I'd say it's better than regular 'invisible' tape, but not quite up there with a super strong adhesive. I've used them as under-counter lighting and they stay stuck well (as long as there's a flat surface). I can't say they'd damage a wall, but I would guess they wouldn't. The datasheet link is broken. There's no href attribute. Is this the same product as http://www.sparkfun.com/products/10259 , except that this is a 5m length? A datasheet is available there. So is it made up of smaller sections, that I could cut apart if required and they would still function correctly? Has anyone tried controlling this strip with the BlinkM MaxM controller? I've used comparable strips with a BlinkM MaxM without a problem, depending on how long of a strip you wish to use. The BlinkM MaxM is rated for 3A (total or per channel?) while 5 metres of these 60 led/m strips running full white should draw 2A per channel (72 watts). is there a reason you got 12V? would be very nice to have a 24V version, so i need half the current for the stripe. You are no doubt working on it, but some specs would be great :-) Like type of LED, power consumption per meter, lumens per color, and manufacturer. Are the LED's on these 5050's ? 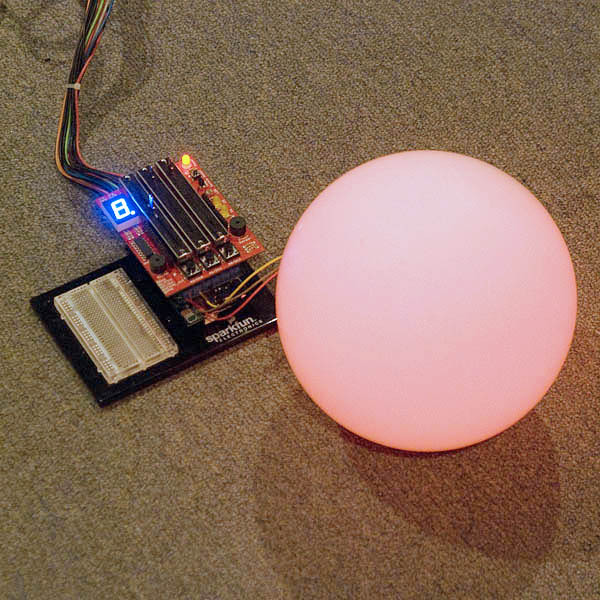 Can you control each LED individually? Any specs or snips of code? Of course you can. Just rip out the 12v wire the add a individual 12v wire to each led. your only problem after that is how to control all 303 wires on the 5 meter length. You could cut it up into segments and solder on some wire if you wanted to control each LED individually (Or segments of LEDs). no, each LED is not addressable. Think of it as one long RGB LED. You can of course control the blending of the three, but not each individual. These would be controlled the same way you would control any RGB LED, but at 12V.